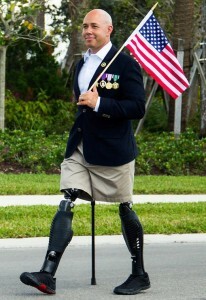 After graduating from High School in 1999, Brian Mast enlisted in the U.S. Army serving for over 12 years. During his service Brian had the honor of serving under the elite Joint Special Operations Command (JSOC) as a bomb disposal expert. Working under JSOC meant fighting at the tip of the spear in the ongoing war against radical Islamic terrorism. Being a bomb technician in this high level of special operations came with a great responsibility. Brian’s task was protecting his fellow soldiers from the war’s most deadly weapon, the improvised explosive device (IED). This meant placing himself directly in the line of fire on each and every mission. While he was able to detect and destroy most of these IED’s, the very last IED he found resulted in sustained catastrophic injuries, which included the loss of both legs. During this time in service Brian was awarded medals for valor, merit, and sacrifice, to include The Bronze Star Medal, The Army Commendation Medal for Valor, The Purple Heart Medal, and The Defense Meritorious Service Medal. Upon awakening in Walter Reed Army Medical Center his focus was singular: get better, get back to work, and get back to serving America. Each day thereafter consisted of 8 grueling hours of physical therapy. In addition to recovery and ongoing military duties, Brian would also provide requested expertise to the National Nuclear Security Administration (NNSA) and the Bureau of Alcohol Tobacco & Firearms (ATF). Following retirement from the Army, Brian continued his work in counter-terrorism and national defense as an Explosive Specialist under the Department of Homeland Security (DHS). In 2015, he volunteered to serve alongside the Israel Defense Forces (IDF) to show support for the freedom Israel represents throughout the Middle East and the world. Brian is a true American hero and is proudly a candidate for Florida’s 18th congressional district. The Wellington Chamber of Commerce graciously welcomes members, non-members as well as prospective members to this monthly event.